A Booming Economy Doesn't Save Children From Malnutrition : Shots - Health News It seems to make sense that economic growth automatically leads to better nutrition for children, and better health. But an analysis of 36 countries finds that's not true. 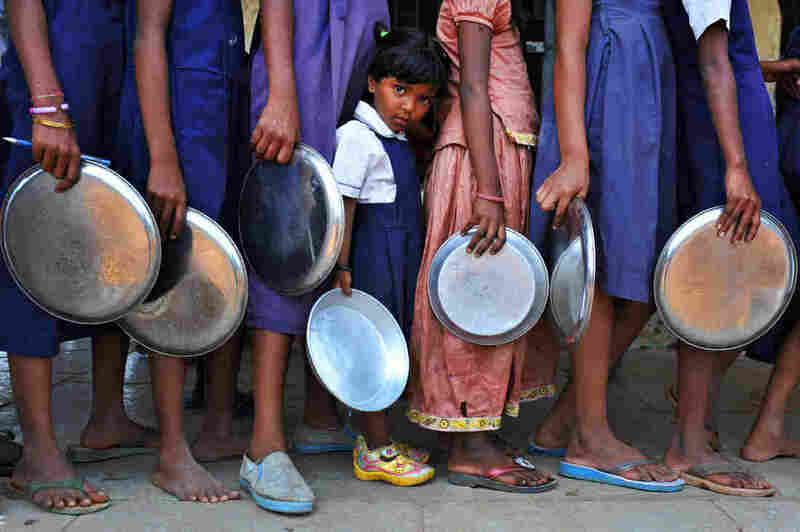 Indian schoolchildren wait in line for food at a government primary school in Hyderabad, India. Consistent access to nutritious food and clean water is key to helping children thrive, researchers say. Lack of food is the leading cause of child death worldwide, killing 3.1 million children each year and accounting for 45 percent of all child mortality. Undernourished children who survive still face a daunting future, including reduced intellectual capacity and a higher risk of disease and disability. And while economic growth is presumed to get more children fed, a booming economy alone doesn't fix the problem, researchers say. Children's health isn't tracking with improvements in standard of living and economic growth, according to S.V. Subramanian, a social epidemiologist at Harvard University and the study's senior author. Subramanian and his colleagues evaluated data from 36 low- and middle-income countries collected from 1990 to 2011. Researchers looked at each country's gross domestic product and the proportion of stunted, underweight and wasted (low weight for height) children under 3 years old. An increase in GDP per capita resulted in an insignificant decline in stunting. And when the researchers compared the changes in GDP to the changes in the number of wasting and underweight children, there was no correlation at all. "It wasn't that [the association] was just weak or small," Subramanian told Shots. That was the case, he said, especially for stunting. More striking was the fact that the effect overall "was just practically zero." He says things like unequal income distribution and lack of efficient implementation of public services are possible causes. The results were published Thursday in the journal Lancet Global Health. Countries that grow economically tend to invest the money back into sectors that led to the growth in the first place, Subramanian says. Consider India, where the tourism industry plays an important role in the country's economy and is a rapidly growing sector. "I see dramatic improvements in four-lane roads ... airports getting fancier, which helps people like me when I'm traveling," he says. "However, for the majority of the population, I don't see improvements for the slums that I pass through every day where I lived." UNICEF did report improvements in overall child nutrition in 2013, but with the number of undernourished children still in the hundreds of millions and with progress slow in the poorest parts of the world, Subramanian says "we haven't made a huge dent, for sure." The latest UNICEF report indicates that among children ages 5 and younger, over a quarter were stunted, 16 percent underweight and 11 percent wasted in 2011, with numbers highest in sub-Saharan Africa and South Asia. The solution starts with understanding how a child becomes malnourished, Subramanian says. One way is through food insecurity, both in access to food and the nutrients in the food available. Another is lack of sanitation and clean water. Both lead to higher incidence of disease, which in turn stunts a child's growth. "We do know that these factors that actually directly affect undernutrition causally have not improved a heck of a lot in these countries ... despite economic growth," says Subramanian.